Parkinson’s disease is one of the most common neurodegenerative disorders with an incidence rate of 17 out of 100,000. 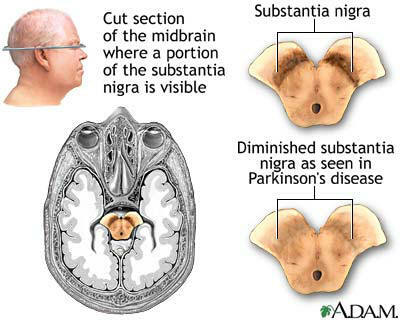 PD is part of a group of diseases with common features labeled Parkinsonian Syndrome (PS), including Progressive Supranuclear Palsy (PNP) and Multiple System Atrophy (MSA). The true definitive diagnosis of the PS disorders can only be made from a post-mortem examination of the brain. The diagnosis of PS until recently was a clinical one, and often proven incorrect with further clinical followup. Pathology only confirms about 80% of clinically diagnosed PD cases. The clinical diagnosis of classic PD is based on four cardinal features: bradykinesia, tremor, rigidity or postural instability. The dopamine transporter (also dopamine active transporter, DAT , SLC6A3) is a membrane-spanning protein that pumps the neurotransmitter dopamine out of the synapse back into cytosol, from which other transporters sequester DA and NE into vesicles for later storage and release. Dopamine reuptake via DAT provides the primary mechanism through which dopamine is cleared from synapses, although there may be an exception in the prefrontal cortex, where evidence points to a possibly larger role of the norepinephrine transporter. In humans, the DAT protein is encoded by the SLC6A3 gene. The initial determination of the membrane topology of DAT was based upon hydrophobic sequence analysis and sequence similarities with the GABA transporter. These methods predicted twelve transmembrane domains (TMD) with a large extracellular loop between the third and fourth TMDs. 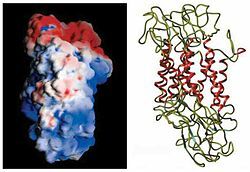 Further characterization of this protein used proteases which digest proteins into smaller fragments, and glycosylation, which occurs only on extracellular loops, and largely verified the initial predictions of membrane topology. While most patients present with clear clinical symptoms, there is a subset of patients that are hard to diagnose due to unclear clinical presentation or lack of response to treatment. There is a tendency to both under and over-diagnose PD, resulting in either a lack of treatment and delayed diagnosis or administering treatment and procedures that are unnecessary. Therefore, a more accurate way to diagnose Parkinson’s Disease is needed. The DaTscan, a dopamine transporter (DAT) single photon emission computerized tomography (SPECT) imaging technique, has recently been approved in the United States to evaluate patients with suspected PS. The DaTscan has been approved for clinical use in Europe for many years for the detection of nigro-striatal dopaminergic neurodegeneration associated with PS and has shown to have a high specificity for PS. This type of imaging uses 123I Ioflupane to bind to the DAT in the striatum and then SPECT visualizes the amount of transporter present. These transporters normally function to reuptake dopamine from the synaptic cleft. The DAT plays a crucial role in the maintenance of the presynaptic neuron and is reduced 50-70% in patients with Parkinson’s. Several studies show a high correlation between abnormal DaTscan and a final diagnosis of either PD or MSA via autopsy although the DaTscan cannot distinguish between the different PS disorders. The DaTscan provides a potential tool to evaluate patients with unclear PS symptoms. It can be used to differentiate between disorders of essential tremor or drug induced PS, which does not have nigro-striatal dopamine transporter loss, from PS as true PS will have DAT degeneration. DaTscan images are interpreted visually, based upon the appearance of the striata. Determination of whether an image is normal or abnormal is made by assessing the extent (as indicated by shape) and intensity of the striatal signal and their interpretation does not involve integration with clinical signs and/or symptoms. Transaxial images are characterized by two symmetric or crescent shaped focal regions of activity mirrored about the median plane. Striatal activity is distinct, relative to surrounding brain tissue (Figure 1). Activity is absent in the putamen of both hemispheres and greatly reduced in one or both caudate nuclei. Activity of the striata with respect to the background is reduced (Figure 4).